The Broad Executive MBA offers the best ROI in the Big Ten. Program is comprised of five semesters over three calendar years. Tuition applies to all in-state and out-of-state domestic students. International students are charged an additional $75 student fee each semester. *Estimated – Actual tuition will be approved by the MSU Board of Trustees in spring of 2019. All admitted students are required to pay the non-refundable enrollment deposit to reserve their seat in the EMBA program. This enrollment deposit is applied to the first tuition payment. Tuition is billed in five equal installments at the beginning of every semester. When I began my Executive MBA at Michigan State University, I knew what all of my commitments would be. The program is all inclusive. Books, class materials, course registration and even meals are all taken care of. All you have to do is show up and learn. The Broad Executive MBA alumni organization has created an Executive MBA scholarship to help provide funding for working professionals who are striving to earn their MBA part time while continuing their career. 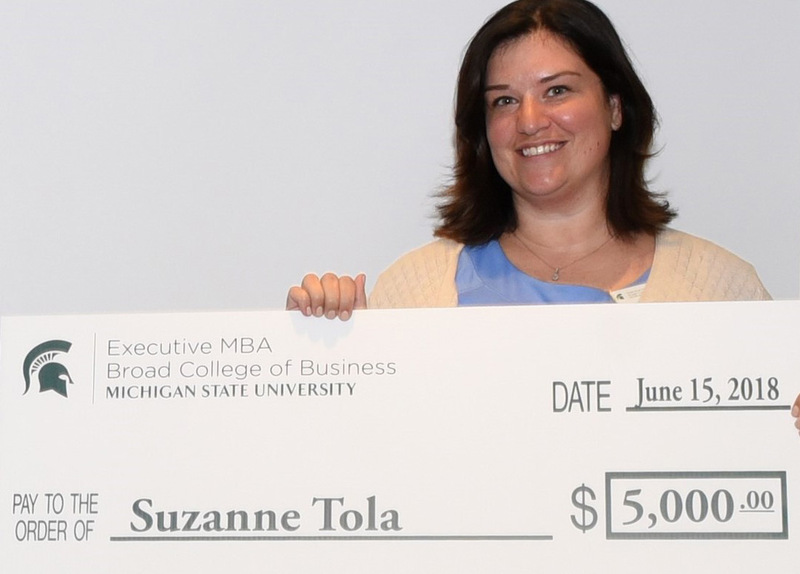 This year, a $10,000 scholarship will once again be awarded to an incoming Broad Executive MBA student who demonstrates collaborative leadership, hardworking excellence and commitment to learning – traits that exemplify the values of the Broad Executive MBA. Candidates who are not otherwise receiving full funding are eligible to apply. The Broad Executive MBA Scholarship Application and all materials are due to the Executive MBA office by Wednesday, May 1, 2019. The winning recipient will be notified in mid-May. The Executive MBA Nonprofit Scholarship provides funding support to individuals who work in the nonprofit sector and have a commitment to continuing to serve the sector. The Executive MBA is pleased to be partnering with the Michigan Nonprofit Association to promote this opportunity. The scholarship is a partial tuition award for individuals who have demonstrated success in the nonprofit sector, intend to make an impact on the nonprofit community, and desire to grow personally and professionally. 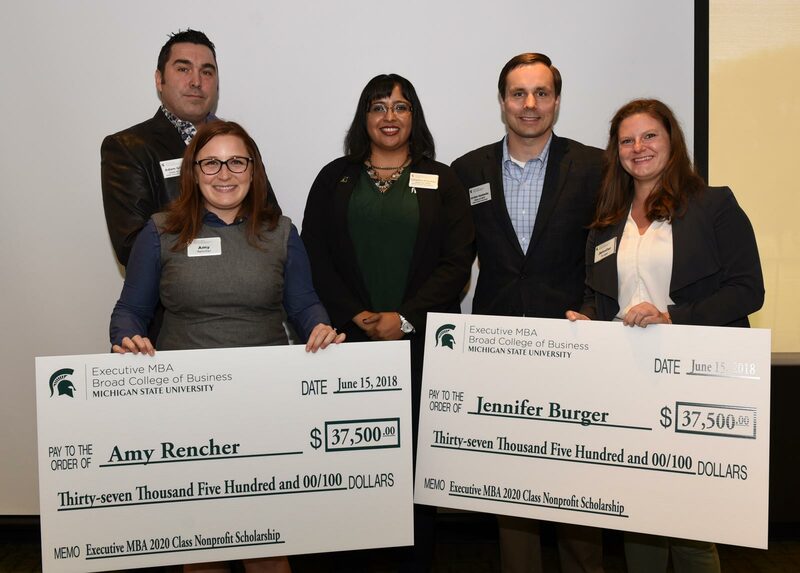 Scholarship candidates must meet all Michigan State University and Executive MBA admission requirements to be eligible for the award. Newly admitted incoming students who are not otherwise receiving full funding are eligible to apply. The application and all materials are due to the Executive MBA office by Wednesday, May 1, 2019. The winning recipient will be notified in mid-May. Find out if your employer offers an MBA funding program. From health care corporations to automotive supply companies to financial services firms, hundreds of organizations have supported students in our Executive MBA program. After all, the Broad Executive MBA benefits the employer as much as the employee; the program teaches students how to make smarter decisions and more valuable contributions on the job – and ultimately boost their company’s bottom line. Executive MBA students are encouraged to investigate all sources of funding, including government and private scholarships. Below are some resources that may offer funding opportunities. Graduate Management Admission Council: a resource for information on graduate programs. If you have additional questions about financial aid options, visit the MSU Office of Financial Aid. You can also feel free to contact Halie Albrecht, the MBA liaison in the Office of Financial Aid. Please identify yourself as a prospective Executive MBA student. This federally guaranteed loan is not based on financial need. Interest begins accumulating at disbursement, but no payment is required until six months after completing the program. The annual loan maximum is $20,500. This loan is not based on financial need. Interest begins accumulating at disbursement, but no payment is required until 30 to 60 days after completing the program. The annual loan maximum is the student’s budget minus all other aid.